South Indian International Movie Awards, shortly known as SIIMA awards excel in felicitating the talent in the four South Indian Film industries namely Tamil, Telugu, Malayalam, and Kannada. The event is held for two days and takes place in a different city every year. The first day of the event is dedicated to honoring Telugu and Kannada films and the second day to Tamil and Malayalam films. All the celebrated stars from the four States attend the event representing their respective film industries. Movie stars like Rana Daggubati, Nivin Pauly, Siva Karthikeyan, Mohan Babu, Khusbu Sundar, Lakshmi Manchu, SP Balasubramaniyam, Shriya Saran, Nikki Galrani, Pranitha Subhash, Shraddha Srinath, Allu Sirish, Regina Cassandra, Prakash Raj, Nayanthara, Trisha etc., have attended the event to celebrate the appreciation of the best talent in the film industry. Ranbir Kapoor and Katrina Kaif who were in promotions of the movie Jagga Jasoos have also attended the event. The event which honored the best films and actors of 2016 took place in July 2017, in Abu Dhabi. It was highly successful and has witnessed the attendance of more than 600 celebrities from South India. This event is considered one of the largest and highly regarded among the South Indian Film industries and is also filled with fun. SIIMA awards 2017 presented some high-powered performances from the top actors like Regina Cassandra, Hansika, Shriya Saran, Usha Uthup, Pooja Hegde, Manjima Mohan, Shraddha Srinath, etc. The best performers in acting and other departments related to films have been honored at the event. The best actors and actresses, comedians, Music directors, Singers, Directors, and Films from the four film industries are venerated. SIIMA also compliments debutante directors and actors along with the veterans. Most of these awardees are selected by public vote and there is a special category where the critics select the best actor and actresses. Highly talented individuals like Prakash Raj, Trisha, Ritika Singh, Nayanatara, Siva Karthikeyan, etc., from Tamil: Srikanth, Anasuya, Priyadarshi, Rakul Preet, Nani, NTR, Vamshi Paidipally etc., from Telugu: Radhika Chetan, Ajaneesh Lokanath, Rashmika Mandanna, Shraddha Srinath, Parul Yadav, Rakshit Shetty etc., from Kannada: and Chemban Vinod Jose, K S Chitra, Prithviraj Sukumaran, Nivin Pauly, etc., from Malayalam film industries, have won awards in various categories. This event is now to be broadcast for the first time on television on four tv channels in four different languages; Gemini TV in Telugu, Sun TV in Tamil, Udaya TV in Kannada and Surya TV in Malayalam. You can even watch SIIMA 2017 on Gemini TV online from any country in the world. 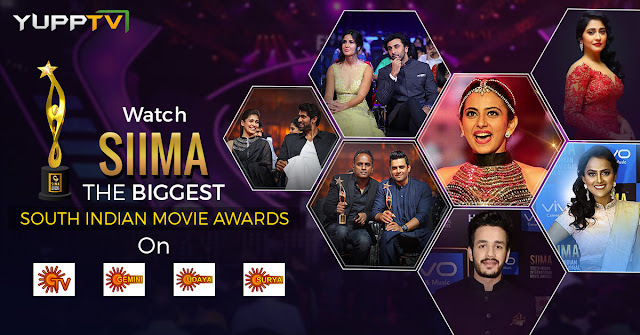 Catch the biggest award function of the year and indulge in the pride of South Indian film industry, the actors and their achievements with us on Gemini, Surya, Udaya, and Sun TV.